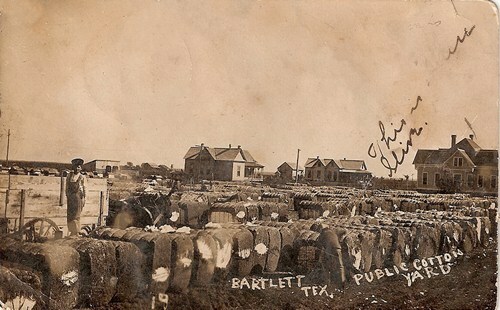 I Remember Bartlett; Bartlett Texas. My grandfather's family was from there. My granddaddy was named Charles Alva Modesette, and he was one of nine children. They had a house with a big wraparound porch there somewhere. My great grandmother used to refer to the mishmash of doings and goings on as "The Modesette Stew". They had a sleeping porch, with suitcases and beautiful old linens on the bed. There was a large, detached garage, that had that wonderful old musty smell. Without fail, if I looked down into the dirt surrounding the garage and the driveway, I could always find little treasures, like old keychains, or old coins, or bottlecaps of beverages I had never heard of. There was a tree, probably a Live Oak, that was tailor-made for climbing, as it had one tremendous thick branch that dipped down to the ground to scoop you up. At night, when the grown-ups were playing cards, we kids could laugh and run around in the dark in the neighborhood, past people's gardens and porches. Each of those nights felt like the Fourth of July, warm and happy and safe. My granddaddy died in August of 1974, the summer before I turned 10. He was laid out for viewing at The Goodnight Funeral Home, and I remember how sad the name of that place made me feel. My cousins and I, being kids, also managed to make that particular visit to Bartlett memorable, and not just sad. We went to Bill's Dollar Store and bought lots of pieces of apple bubble gum. We took a walk all around downtown, and went and played pool in the old pool hall. I think it was called The Centennial Club. 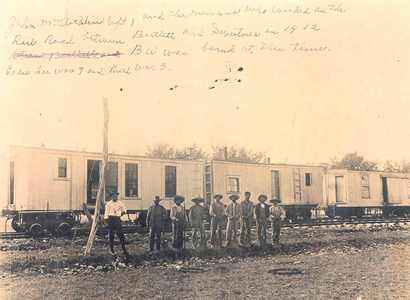 We walked in that dry heat, past the railroad tracks, and the railway cotton bins that looked like cages, with cotton still clinging to the sides. I remember taking my shoes off, walking near the tracks, and feeling the exhilaration and excitement of laying out pennies to be squished. When we got home, my feet were black, and my cheeks were bright red from the heat. And the great aunts were horrified, tut-tutting that we kids had gone into an old beer hall. We didn't know any better, the place was empty, as it was probably only 2:00 in the afternoon. The bartender was really nice. My granddaddy played the piano. We used to sit in the stuffy parlour where the candy dishes were laid out, and listen to the beat he kept with the heel of his right foot, as he rinky-tinked out Georgia Brown. He was really good, and played in country bands in honky tonks. He was a sports writer, Charlie Modesette -- in Fort Worth and in Bisbee, Arizona, and I guess my mom and my aunt went to schools in both towns. But Bartlett was the family hub. I have not been back in years, but I heard that the town was experiencing a scandal. Clearly, the innocence of the "Good Old Days" has been replaced somewhat, and that is sad. But I'll bet if I head there, and drive around, and get out and walk a bit, it will still smell the same. The railroad tracks and the cotton will be there. 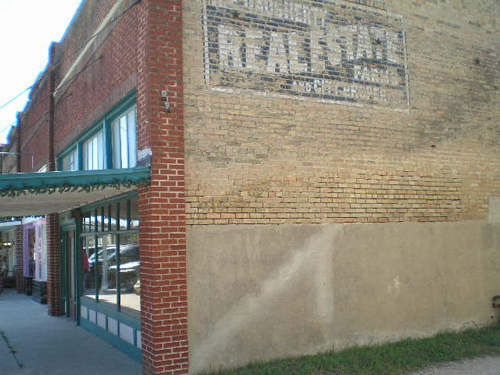 There will still be old brick buildings with fading advertisements printed on the sides. And maybe the old family house is still there.